So Pickin' Cute (Continued): Oh Baby! 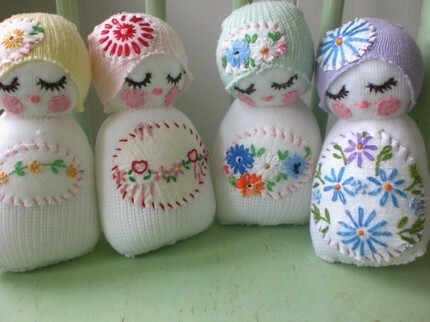 I can finally justify purchasing one of these cuties from Chickabiddy Baby Boutique on Etsy! I fell in love with them probably over a year ago, but Kalia was a bit too old for a rattle...but guess what! We're expecting another little blessing in November!!! I wanted to get through the first trimester before sharing the news - and now that you know, I would love to share my ideas for the nursery and playroom once we get started. Hopefully the baby will cooperate, and we will find out the gender at the end of June. Then...let the design process begin!!! PS Chickabiddy Baby Boutique has some masculine rattles too ~ so no worries if it's a boy! Yay yay yay! What wonderful news for me to read today!!!! Congratulations to you :) and enjoy your escuse to buy one of those- so very cute! Thanks for the congrats! I'm so glad that everything is going well with your poor little pooch. :) I'm heading over to your blog! It's like we have ESP- even though i saw this was the same post I had already read, I decided to swing by and LOOK you left a comment for me here AWWWW!!!!!!!!!!!!!!!!!!!! Have I mentioned how excited I am for you and your big pregnancy news? So excited!